Why would I need self storage in Tacoma, WA? There are a variety of reasons why you might need self-storage in Tacoma, WA. How much is a storage unit in Tacoma, WA? The cheapest storage unit in Tacoma, WA is $20.00 per month. What size storage units do you have available in Tacoma, WA? In Tacoma, WA we have sizes that range from 2'x5' to 20'x30' to suit your storage needs. How much is it for a 2'x5' storage unit in Tacoma, WA? The cheapest 2'x5' storage unit in Tacoma, WA is $25.00 per month. Tacoma is a mid-size port city in the state of Washington, and it steadily grown since its founding in the late 1800s. While one of the draws of the city is that it isn't far from Seattle, Tacoma itself offers plenty of job opportunities, entertainment options and community events. It's also home to a large and diverse population, important historic and architectural landmarks and many parks and green spaces. Tacoma's Point Defiance Park is one of the largest urban parks in the country, totaling over 700 acres. There, you can explore large rose and rhododendron gardens, scenic beaches, a boardwalk and the Port Defiance Zoo and Aquarium. With Tacoma's variety of amenities, scenic location and healthy economy, it's no surprise that it has continued to grow over the past several decades and earn the distinction of being one of America's most livable cities. Tacoma earned its nickname, "the City of Destiny," when it was chosen to be the western terminus of the Northern Pacific Railroad in 1873. This brought merchants, residents and developers to the area in droves. Before this, the Tacoma area had been settled by a number of families but hadn't had the economic boom those families were hoping for. Then, between 1880 and 1890, the population grew from about 1,100 to over 36,000. During the 1920s and 30s, Tacoma stalled a bit, due mainly to its struggling power grid and newly rewritten state constitution. In an attempt to prevent the city from falling under the control of a monopolized economy, the new constitution actually began to suffocate its economy. This decline continued through the 1980s and '90s, when rejuvenation efforts began to turn things around. Tacoma underwent significant changes that revitalized the local economy, arts and culture. Today, Tacoma has an active, diversified economy with a number of well-known corporations headquartered in the city. True Blue Inc., Simpson and Roman Meal all maintain their home base in Tacoma, and U.S. Oil and Refining and State Farm Insurance have large operations within city limits. If you're planning to look for a job in Tacoma, you'll find a diverse range of options. Local government offices and the health care industry are two of the largest employers, with Joint Base Lewis-McChord providing tens of thousands of jobs in the area. Hilltop is one of Tacoma's most diverse communities, and it's also included on the National Register of Historic Places. It's named simply for its geographical location, sitting atop a large bluff that provides views of the port and Commencement Bay. Spanning a section of road along Tacoma's Sixth Avenue, this neighborhood is one of the latest to be revived by the city's rejuvenation efforts. Here, you can find vibrant nightlife, award-winning restaurants and unique local businesses. The McCarver Neighborhood is located in the city's downtown district and is often recognized for its maple tree-lined Yakima Avenue. It was home to the first magnet school in the country, McCarver Elementary School. The Lincoln District is known for its vibrant Asian community, and there are several pieces of Asian-influenced public art dotting the neighborhood. Here, you can experience the Tet New Year Festival, which celebrates the Lunar New Year with international food and cultural performances. The Tacoma Public School District manages the majority of public schools in the city. 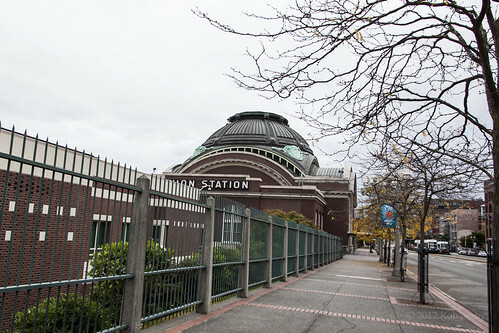 The district offers a number of alternative schools, including a virtual learning campus and the Tacoma School of the Arts. You can also enroll your child in any one of the city's many private schools, with both parochial and secular options available. Tacoma is home to many post-secondary schools, both private and public. The University of Puget Sound, Tacoma Community College and Bates Technical College are just a few of the campuses you have to choose from. Utilities: Tacoma Power is the city's central electricity provider, while Tacoma Water manages residential water services. Garbage and Recycling: The city facilitates regular collection of trash and recyclables, with schedules determined by your specific location. Transportation: There are many public transit options to choose from in Tacoma, including light rail, bus, ferry and commuter rail. Although the median home price in Tacoma is slightly higher than the national average, it's still much less expensive than many other Washington cities. You'll be able to explore many different housing options, ranging from large single-family homes to small, studio apartments downtown. The city also offers a limited number of new home construction permits every year, so purchasing land and building your own home is another option. Our lowest priced units in Tacoma, WA average $55.20 per month. 1400 people have reserved units in Tacoma, WA in the past 30 days. There are 25 locations within Tacoma, WA's city limits. There are 3 locations in Tacoma, WA that offer AC and Heating features.